Fastjet FTZ1A (Airbus A319) shortly after landing in Dar es Salaam JNIA on its inaugural flight (Fastjet). A new ‘no frills’ airline called ‘Fastjet’, modelled on the Easyjet airline which has revolutionised air travel in Europe, was launched in Africa on November 29th. The famous entrepreneur Sir Stelios Haji Ioannou, who started Easyjet, has joined with Lonrho’s airline, which flies in West Africa to establish the new group. Significantly, Fastjet chose to begin in Tanzania and Dar es Salaam airport will be its first African hub. It has already leased two planes, has 15 more on order (all Airbus A319s with a capacity for up to 156 passengers), and plans to build up to a fleet of 40. Tanzania’s dynamic Minister of Transport, Dr Harrison Mwakyembe, spoke about the unusually speedy implementation of this vast project when he addressed a crowded AGM of the Britain Tanzania Society in London in mid November. Fastjet plans to expand from Tanzania into Kenya in 2013 and then to Ghana and Angola which are already served by the Lonrho airline. It is advertising for pilots, passenger services agents, cabin crew and crew managers and also for retail sales agents in the East African media. The Citizen wrote that the launch had taken the country by storm, as the airline transported 900 passengers in eight flights from Dar to Mwanza and Kilimanjaro and back on its first day! The airline’s management told investors that demand for seats on these routes far outstripped supply. In slightly over a week, Fastjet had recorded 8,000 bookings for its first two routes and the Fastjet.com website had received over 20,000 hits in its first four days. Fastjet sells air tickets as cheap as $20 (TShs 32,000) one way pre-tax, although most tickets are expected to sell at around TShs 120,000 according to Chief Executive Ed Winter. This is still significantly less than its main competitor, Precision Air, which charges about TShs 375,000 for a return ticket between Dar es Salaam and Mwanza excluding taxes. Precision Air operates three flights a day on the Dar-Mwanza route. Air Tanzania (ATCL) operates one flight a day for the same route, while Fastjet now operates two flights a day. The London Times, in its coverage, emphasised the new airline’s mascot. In an article under the heading ‘Parrot prepares to take to the skies,’ it wrote that Sir Stelios had taken the African grey parrot as the airline’s mascot. It said that the African grey was renowned for its intelligence and therefore the perfect personification of the smart way to fly. What will happen to Precision Air and Air Tanzania? Precision Air, the main Tanzanian airline, has been developing rapidly and, unlike Air Tanzania, is a well managed and successful airline. It has 13 aircraft and is not paying dividends to shareholders from its profits (TShs 634 million last year) but using them instead to modernise its fleet. It seems likely to face strong competition from Fastjet on the routes it covers. 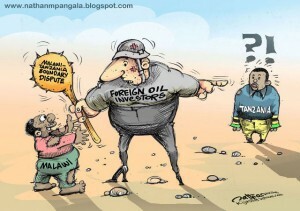 However, according to the East African, it may have already adopted a strategy to protect its Tanzanian market. In November it received a new 50-seater ATR 42-800 plane, thus being the first airline to operate this new model, and is expected to receive two more as part of a three year $100 million fleet expansion plan. ATR (Aerei da Trasporto Regionale or Avions de Transport Régional) is a French-Italian aircraft construction company headquartered in Toulouse, France. The ATR’s are able to land at most of Tanzania’s airstrips many of which have hangers that cannot accommodate bigger planes. Air Tanzania Company Ltd has had such a blighted history, exacerbated often by poor management, that many are said to be wondering if it has any future in the new age of fierce competition. But it struggles on and in October 2012, after a long gap when it was not operational, it took to the air again with its two aircraft – a 50-seater Dash SQ-300 and a leased Boeing 737-500. It also has to cope with other competition in Tanzanian airspace including planes from Link, Kenya airways, Fly 549, Air Uganda and Rwandair. Immediately after the first Fastjet flights the two older airlines issued a statement which said that Fastjet was not a threat to their businesses because of the quality of their services and customer loyalty that they had cultivated over a long period. 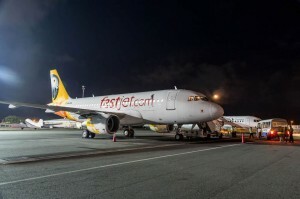 ATCL Acting Commercial Director Mwanamvua Ngocho noted: “I don’t see any threat, though we perceive the coming of Fastjet as a challenge for us to come up with more innovative services. These are business techniques which aim at capturing human psychology without necessarily reflecting the real cost of travelling…Otherwise, we will work together without any problem,”. She also expressed doubts about the sustainability of the low budget airline, saying it would take a short time for Tanzanians to understand that the real flying cost is almost the same as other airlines especially with bags and other luggage taken into account. Fastjet said they were not launching a price war with other operators but aimed at stimulating the market by attracting new travellers who had not been flying before. As this issue goes to the press, there are reports, as yet unconfirmed, of a possible partnership with Emirates and moves to establish a hub in South Africa (London Times 5th December). The government has called for bids from 20 international firms for the construction of a third terminal at the Julius Nyerere International Airport in Dar es Salaam as traffic increases substantially each year. The expanded airport aims to step up passenger numbers to 8 million per year. The successful bid will be announced in January 2013 and the work will be done under a public/private partnership arrangement. The airport was constructed in 1984 when passenger numbers were 1.5 million. Approaching its 100th birthday, the lake steamer MV Liemba still travels once a week to ports on Lake Tanganyika in Tanzania and Zambia. Built in Hamburg in 1913, it was sunk by its German crew during the First World War when named the Goetzen. It has been many times rehabilitated but may now need to be sent into retirement – probably to become a museum. It has not escaped the eyes of Minister Mwakyembe who has been to Germany in the hope of rekindling interest in the ves­sel, for which many Germans are said to have much affection. Tanzania, Zambia, and China have agreed on 12 new projects to help improve the performance of the Tanzania-Zambia Railway (Tazara) line which has become dilapidated over recent years. Cargo has dropped from 1.2 million tonnes in 1992 to 330,000 tonnes in 2011-12. Passengers are down from its original 3 million capacity to 790,000 in the same period. China is providing £42 million for rehabilitation of 42 passenger coaches, 6 locomotives and rescue and lifting equipment. 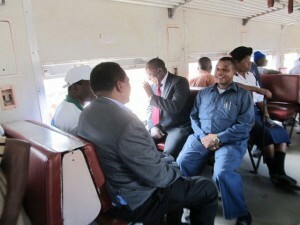 Tanzania’s first ever commuter rail service was launched on 29th October. The first route (operated by Tanzania Railways Ltd TRL) covers 20km between Ubungo-Maziwa and the central railway station, while the second is operated by Tazara and covers 25km between Mwakanga (Pugu area) and the Tazara station. Initially a single train is operating on each line, shuttling to and fro during the morning and evening rush hours. A one-way ticket costs 400TShs (about £0.15), and just 100TShs for pupils, comparing favourably to daladala fares which range between 500 shillings and 1,000 shillings depending on the journey. Inaugurating the new service, Dr Harrison Mwakyembe said TSh6 bil­lion (£2.3 million) had been spent renovating train carriages and railway infrastructure for the TRL line while about TSh800 million (£0.8 million) was spent repairing the Tazara tracks. He thanked TRL officials for their decision to forgo purchase of brand new railcars in favour of renovating old ones which allowed the project to remain within budget. As of December the government has stopped issuing licences to private companies that operate small commuter buses (daladalas) in Dar es Salaam, as part of its plan to replace them with much larger buses under a government-managed rapid transit system (DART) (see TA 98). This line lost 83 kms of track in the floods last year and then had to cope with the disastrous contract with an Indian management company which eventually had to be terminated. A very limited service is now being offered. This line promises to be the Minister’s biggest headache. The biggest project being planned by Tanzania’s Ministry of Transport is the construction of a new port at Mwambeni Bay, Tanga. It is part of a grand project to develop an alternative sea route for Uganda and other land-locked countries such as Malawi, Zambia, Rwanda, Burundi, Uganda and the Democratic Republic of Congo, which have been depending on the overcrowded port of Mombasa. The project, a joint effort with Uganda, would include a new railway from Arusha to Musoma and a new port on the Ugandan side of Lake Victoria. 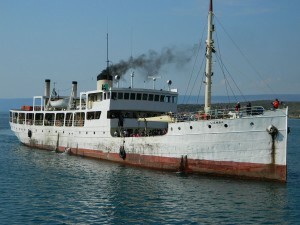 Freight would be conveyed from Musoma dock by ferry to Port Bell pier – about 350 kilometres inside Uganda. A rail connection runs via Tororo to Gulu – nearly 600 kilometres on the Pakwach branch. North Gulu. A new line of roughly 250 kilometres would be constructed to Juba, and a further 550 kilometres to the Wau railhead in Southern Sudan. President Museveni of Uganda has repeatedly said that Musoma port was the “lifeline” of Uganda’s dreams. A feasibility report prepared by UK-based consultants United Research Services recommended the construction of the new Tanga port because the present capacity would hit its maximum pressure in 2016. Although the existing port could be increased to accommodate short term traffic growth, it would become very congested. The team believe that export of soda ash from the proposed project at Lake Natron would only be possible with new port facilities. However, a section of industrialists saw no logic in constructing a new port at Mwambeni as opposed to undertaking the rehabilitation of the old port. A speaker at a Stakeholders’ meeting on this final feasibility study said that talks about the new port dated as far back as 1968, when a founda­tion stone was laid on the proposed site. Conservationists at the meeting demanded that the project be scrapped to preserve the Coelacanth marine park (the primordial fish that was earlier believed to have been extinct since the end of the Cretaceous period) and sea tourism. The Minister for Transport made his position clear and assured Tanga residents that the government had not forsaken Tanga. Reacting to the alleged threat to the Coelacanth, the Minister said that government was being very cautious over the matter, noting that a very thorough feasi­bility study had been conducted to make sure it was on the right track. The report caused fresh outcry from environmentalists concerned that the proposed railway extension is expected to pass through the Serengeti National Park. This is a development which environmentalists are vehemently opposing, arguing that the ecosystem would be disrupted with noisy trains passing through the wildlife sanctuary. They claimed that this was what had caused the plan to be shelved during the days of the late President Nyerere when the idea was first mooted in the late 80s. Officials of the two countries have said the project is provisionally estimated to cost $2.7 billion, out of which $1.9 billion is for the construction of the railway line, $672.6 million for the development of Mwambeni Port and $72 million for the development of Musoma dock. Prominent Channel Ten TV reporter Daudi Mwangosi (40) was killed on 2nd September while a demonstration he was covering in Nyololo Village in Iringa region was being dispersed by police, attracting widespread concern and international condemnation. A joint committee formed by the Media Council of Tanzania (MCT) and Tanzania Editors Forum (TEF) to probe the circumstances that led to his death released its findings on October 8. At the press conference, MCT Secretary General Kajubi Mukajanga said evidence proved beyond reasonable doubt that the police had deliberately and consciously intimidated Iringa-based journalists covering Chadema activities at Nyololo Village. “The investigation was independent and was not meant as a police inquiry or judicial inquest, but as an honest documentation of the state of affairs surrounding the first ever killing of a Tanzanian journalist on duty,” Mr Mukajanga said, “Generally, this committee – based on the evidence collected in the region – concludes that there was a tense and suspicious relationship between the two sides. 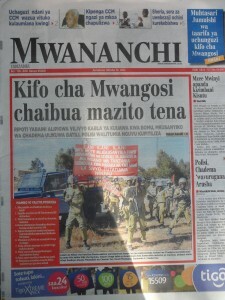 Mwangosi was killed in cold blood in the hands of the police”. The committee made field visits and conducted interviews with journalists based in Iringa, Chadema officials and eye witnesses. Evidence collected included video clips, still pictures and publications, and broadcast materials from media organisations. 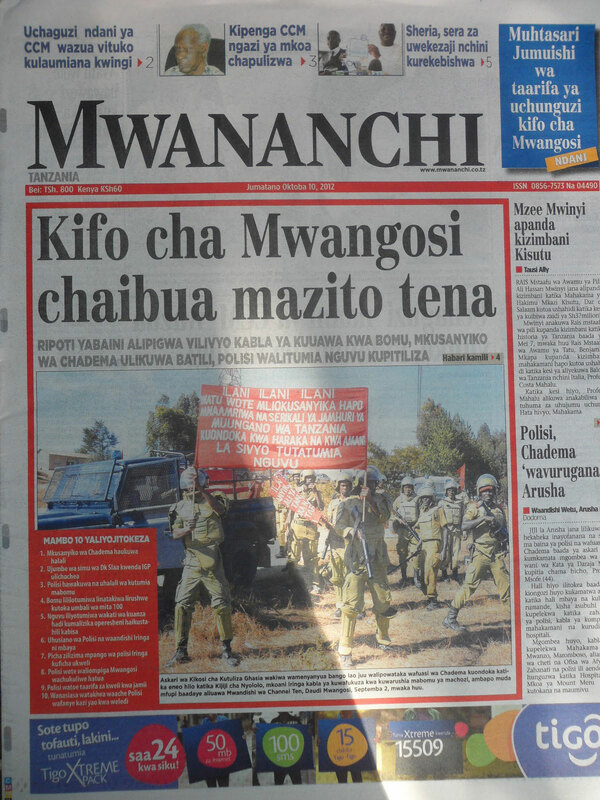 To support the allegations of the “tense and suspicious” relationship Mukajanga noted that, in November 2011, Iringa-based ITV reporter Laurean Mkumbata was brutally beaten and his working equipment destroyed in front of the Iringa Officer Commanding the District. 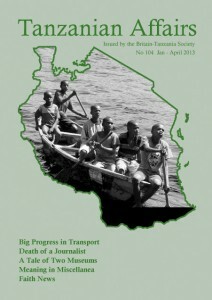 “In similar incidents, the committee has learnt that towards the end of February 2011, Iringa-based journalists were mistreated during the official visit of Vice President Mohamed Gharib Bilal.” Mukajanga said that, Iringa journalists were denied accommodation in hotels, a situa­tion that forced them to sleep in a bus they were travelling in. Meanwhile, a Special Committee was set up by Minister for Home Affairs Dr Emmanuel Nchimbi, under Judge Stephen Ihema, which also reported in early October. The committee established that there was excessive use of force by police, but ruled this out as the cause of the death of Daudi Mwangosi. The committee was, however, unable to reveal what caused the death of the journalist as the case was already pending in a court of law. A ‘Daudi Mwangosi Fund’, aimed at taking care of journalists in trouble due to their working environment, is being set up. The border dispute between Tanzania and Malawi (see TA 103) has taken a new twist, prompting the contending parties to seek mediation before retired eminent persons of the Southern African Development Community (SADC). Foreign Affairs and International Cooperation Minister, Bernard Membe, told journalists that this latest move was reached to avert a looming stalemate over the exact ownership of Lake Nyasa. Membe said the two sides had now officially agreed that there were two fundamental issues – Malawi maintains that the Lake north of Mozambique belongs to Malawi in keeping with the 1890 treaty signed between the German Government for Tanganyika and the British Government for Nyasaland, while Tanzania maintains that her border passes straight through the middle of the Lake – splitting the northern part of the water body roughly into two equal parts – as an international border. Given such fundamental differences, both sides had seen the need to find a mediator to lead the next processes of the negotiations, with a view to finding a lasting solution to the dispute. It was therefore proposed that they should send a letter to the SADC mediation committee, chaired by former Mozambican President Joachim Chissano, early in December. The letter will request the former Mozambican leader to form a team of professional lawyers and other experts from across the African continent that would help sort out the legal aspects. The committee would have three months to tender its recommendations i.e. by late March 2013. The minister added that should a decision mutually acceptable to the contending parties elude this committee, the matter would then be taken before “the highest levels of international arbitration”, such as the International Court of Justice, for further mediation. Membe said an appeal to the International Court of Justice (ICJ) would be made in accordance with the Vienna Convention on the Law of Treaties (1969), which could provide the framework for a speedy solution. He explained that the meeting had been called specifically to discuss the various options available for resolving the boundary issue which had been rec­ommended by the joint committee of officials from both countries who had met on November 18. Malawian Foreign Affairs Minister Ephraim Chiume expressed opti­mism and thanked President Jakaya Kikwete and President Joyce Banda for the steps they had taken to ensure the matter would be resolved amicably. While Tanzania’s economy, with the help of its increasing supplies of gas, forges ahead, the country’s agricultural industry receives less notice. In fact, agriculture is finally moving ahead rapidly under the influence of the Government’s ‘Kilimo Kwanza’ policies and also the greatly increased interest in agricultural investment by local and foreign investors. The latter, although very keen to bring in huge sums for investment, are operating in a climate of mounting criticism and suspicion that they are involved in ‘land grabbing’ and forcing peasant farmers off their land. Nevertheless, it is believed that some significant investments are being made. although often in an almost clandestine form. TA has been very limited in its coverage of agriculture and we need a volunteer to join our editorial team to cover at least some of the many exciting developments under way. We mention below a few of these – Editor. The German based development finance institution DEG – Deutsche Investitions-und Entwicklungsgesellschaft (German Investment Corporation) – has launched a Coffee Partnership for Tanzania (CPT), to bring together Tanzanian smallholder coffee farmers and DEG with private sector partners. The four-year project aims to increase the net income of 85,000 smallholder coffee farmers by doubling their yields and by improving the quality of coffee produced, thereby providing a better livelihood for up to 510,000 people. DEG’s Project Director for CPT, Ian Lachmund, said that the project is financed by the Bill & Melinda Gates Foundation through a $ 8 million grant. The project activities include promotion of well-governed farmer groups, training of farmers in basic business and agronomy skills, improvement of farmers’ access to finance and affiliating producers to certification schemes – thereby increasing overall productivity and quality and improving smallholders’ access to stable export markets. “Additional activities in the areas of gender, seedling multiplication and distribution and renewable energy, as well as livestock and food pro­duction, will be undertaken to promote the environmental and social sustainability of the partnership,” he said – Guardian. There were some 70 foreign and over 40 local investors at an Agribusiness Investment Showcase in late November. This brought together the government and private sector to display investment opportunities within the Southern Agricultural Growth Corridor of Tanzania (SAGCOT) and to accelerate investment in this sector of Tanzania’s vibrant economy. SAGCOT’s objective is to foster commercially successful agribusinesses to benefit the region’s small-scale farmers, and to improve food security, reduce rural poverty and ensure environmental sustainability via the public-private partnership method. Initiated at the World Economic Forum (WEF) Africa summit in 2010, the aim is an inclusive, multi-stakeholder partnership to rapidly develop the region’s agricultural potential. The founding partners will include farmers, agri-business, the Government of Tanzania, SAGCOT and companies from across the private sector. The event, held at the Bank of Tanzania (BOT) conference centre, was introduced by Prime Minister Mizengo Pinda. He highlighted the Government’s plan to invest USD 1.3 Billion to leverage about USD 2.1 Billion from the private sector to transform and commercialise small­holder agriculture in Tanzania. He also highlighted the tremendous potential for investment in agribusinesses in Tanzania with 44 million hectares of arable land, of which only about 25% are utilised, together with huge potential for livestock and fisheries development. The event attracted 70 foreign prospective investors and over 40 local companies aiming at taking advantage of investment opportunities within SAGCOT. The government has assured peasant farmers living around the 63,000-hectare Mkulazi Farm that the proposed commercial agriculture investment project would not grab their land. Instead, the government would take precautions to ensure that any land ownership contracts will benefit Tanzanians living in the project area and the country at large. The Tanzania Investment Centre (TIC) is running an intensive promotion of the Mkulazi area , named the Southern Agricultural Corridor of Tanzania (SAGCOT), to encourage local and international investment aimed at turning the area into a sugarcane and rice production hub. The project would see the construction of two sugar factories with an annual production of 300,000 tonnes, which would end the sugar shortage com­pletely and open doors for large exports. As various investors visited the area to view the available potentials, villagers who run agricultural activities close by raised concern to government officials over the visitors’ commitment in developing the area and its impact on the lives of the neighbouring community. They said experience had shown that investors packed and left hurriedly after they failed to fulfill targeted obligations, without considering paying their workers, most of whom were residents of the area. Mr Chiza said implementing the project would see development of infrastructure in the area through construction of roads and bridges. the installation of power systems and Tazara Railway services would be improved. Investors would bring technology that would be helpful in transforming traditional agriculture to commercial farming that was valuable in the fight against poverty in the country. “The government, through TIC, will carry out sensitisation meetings at grassroots level, aimed at increasing public understanding of the agenda and translate the available opportunities to a win-win situation,” he said –The Citizen. Tanzanian small farmers are among beneficiaries of a $210 million investment fund, promoted by the Export Trading Group (ETG) and aimed at opening market opportunities for traders. It is based in Tanzania and has operations in sub Saharan Africa. It connects smaller farmers to consumers around the world by procuring, processing and distributing agricultural commodities. It sells the goods to countries like China and India – The East African. According to Land Portal, a data base on international land deals, Tanzania has leased more than 1.4 million hectares to foreign companies from Europe and Asia including 100,000 hectares to a Norwegian company for the planting of trees and 45,000 hectares to a British company for the cultivation of sorghum. An American company’s efforts to lease 325,000 hectares in Rukwa region is being disputed because it is said to be threatening the livelihood 160,000 Burundi refugee households. Controversy surrounds discussion about investments in cotton contract farming by ginners and others but the government has stated that rules had to be followed if these were to be successful. The London Times has reported on the results of the Royal Society of Chemistry’s offer of £1,000 to anyone who can explain the counterintuitive Mpemba effect on freezing hot water (described in TA 103). But the paper said that there was still no real solution. The Society had been swamped by the number of responses it received and had had to take on extra staff to cope with the rush. They received more than 200 responses from Croatia alone; 7,000 from the US; 800 from Britain; 880 from China and four from Afghanistan! The Society has decided to ask people to vote on which of the solutions offered they consider to have been the best. Times readers were recommended to visit the Society’s website for details. On the 13th anniversary of Mwalimu Nyerere’s death on October 13, the Citizen published an article by Saumo Mwalimu commemorating the first President’s time living in Magomeni Usalama in Dar es Salaam and later in Butiama, Mara region. ‘In a not-so-secluded alcove right in the middle of the city is a building whose walls could speak volumes about the founding of this nation. Located a mere four kilometres from the heartland of Dar es Salaam, an ancient structure stands tall, its national flag pulsating to the beat of a gentle city breeze. When visitors descend on this whitewashed building they are left without any doubt that it is an important landmark. The national livery, in splendid yellows and greens and blues and blacks stands ready to welcome guests. There is also the giant placard outside the property which reads in Kiswahili: “Makumbusho ya Kumbukizi ya Mwalimu Julius Kambarage Nyerere”… This rather verbose description lets visitors know the site is a tribute to the life of the founding father of Tanzania. As monuments go, it is a rather humble abode. It is however perhaps a fitting memorial to the legendary statesman, who is remembered for championing egalitarian causes that saw the promotion of Ujamaa, a mode of African socialism that sought to put economic and social power in the hands of the masses…. However, the building has never been good at attracting guests despite its ties to a man whose life is intrinsically linked to the history of the nation. Passersby often cast sidelong glances over the gate as they go on their way; as if to try and sneak a peek inside without having to actually go in. Mwalimu Nyerere lived in this house after he quit his teaching post at St Francis College (what is now known as Pugu Secondary) to take up full time the cause of Tanganyika’s independence, according to curator Ms Victoria Bache. “In this house Mwl Nyerere hosted meetings of the Tanganyika African Association and (its successor) the Tanganyika African National Union (TANU),” she said, pointing out that the build­ing is testament to the history of the struggle for independence in Tanganyika. After he had left his job at St Francis, Mwl Nyerere moved in with other political activists but these new dwellings were deemed perilous for a man of his stature. He subsequently moved to Maduka Sita in Magomeni, where he resided in “Shop Number Four” according to Ms Bache. He was given the Usalama plot by one Sheikh Abeid Karuta, where he built from scratch and moved into his new home in January 1959, two years before independence in 1961. Mwalimu stayed at the complex for only eight months. He was moved to Sea View after he became the chairman of TANU. Despite its rich history, the Usalama museum has had a tough time drawing in foot traffic since it officially began operations early in 2012. according to its curator. “It’s hard to blame anyone for this,” she said, adding that very little had been done to promote the site. From March to November 2012 the monument and museum brought in a total of TShs 93,700 from just 163 visitors. Entry costs TShs500 per person. The curator admits that there is not much to see in the museum. The few items on display include several family beds that Mwl Nyerere owned at some point, cookers, a radio, some medals, sofa sets and bathroom fixtures. Very few of the original fixtures have survived the years of neglect. Most have been sold off and some are in the hands of Mwalimu Nyerere’s family. “I’m doing my bit to keep this place going but I can not do it alone” she said. As the Dar museum struggles, business is brisk at its twin in Butiama, Mara region. The number of visitors there is picking up according to Curator Emmanuel Kyondo. Established in 1999, the centre receives around 9,000 visitors every year, all this despite the fact that it is located 48 kms from Musoma and a full 180 kms from the city of Mwanza. Visitor numbers might be on the rise but many more potential tourists are put off by the lack of suitable lodging facilities in Butiama, Kyondo said. “That’s a big hassle; the lack of proper hotels and lodges. Many visitors would have to drive in, then drive back out to Musoma where there are nicer and more reliable hotels and guesthouses” Kyondo added. Nearly half a century since the English Club closed its doors, remnants of its library can be found in the same room of the same building that once housed this bastion of English society abroad. During the era in which Zanzibar was a British Protectorate, its library was central to its members’ leisure and learning; but within the building’s current incarnation as the Africa House Hotel, the remaining books stand in cabinets inaccessible behind a locked door. The numerous cardboard boxes within reveal that the once-active library has become a storeroom, and it is through glass panes the books’ spines relate their titles and authors. Once bright, thorough, and visited daily, its current state is that of a neglected and mildewed miscellany. This study is rooted in the notion that the same object can be admired or rejected, and the objects in question are English-language books that exist in various forms and locations throughout Stone Town, Zanzibar. The ways in which people respond to and use meanings have material, social, and cultural consequences for themselves and those meanings. It is proposed that books can inhabit numerous nuances of meaning and value depending upon the web of wider social relations that surround their location in time and space. Three categories of English-language books are identified for the purpose of this study: Artifactual; Second-hand; and New. The Artifactual are those of the English Club library that still exist within the Africa House Hotel. Remnants of this library are also found in curio shops in Stone Town and offer a fascinating insight into the reading habits and interests of those who are long-gone yet evidence of their presence remains. Second-hand books are worthy of consideration as significant objects within the landscape and social fabric of Stone Town. Their origin and destination are largely the Western consumer, whilst their circulation is facilitated by Zanzibari booksellers. Notions of value and meaning can be extrapolated as a result of the encounter between local practices and ideas with Western forms. New books sold in Stone Town are predominantly priced above the financial capabilities of most Zanzibaris. Whilst reading is not as essential to the human system as eating or sleeping, the interplay between the concept of reading as nourishment for the mind and yet not essential to survival suggests that perceptions of books as valuable commodities are blurred. If books are pre-eminent as vehicles for information and education, and a source of culture and recreation, then a discussion of the presence of such a large number of books that serve transient tourists contributes to the stereotypical and outdated, yet created and maintained, societal differences between the Western, literate and wealthy world, and the Third, illiterate and poor world. Perhaps the Swahili proverb ‘Elimu ni maisha, si vitabu’ (‘Education is life, not books’) informs a difference in social mores, as Zanzibaris might not consider books a means to an end and are not imbedded in the notion of lifelong learning or reading for pleasure. The impact of books donated from Western agencies is also questioned insofar as their effects contrast with their intended purpose. Books are shown to be potent objects of analysis, especially as Zanzibar possesses a complex history of cultural exchange. Exploring the book as an object that possesses a cultural biography enables the reconstruction of human interactions and variants of meaning and value that can inhabit the same object as perceived by different people, all the while entangled within the history and society of Stone Town. Jono Jackson recently graduated with an MSc in African Studies from St Antony’s College, University of Oxford. He also studied Swahili & History at SOAS which included a term on Zanzibar. He has travelled extensively throughout Tanzania, and was a contributor to the 2nd Edition (2009) of the Footprint Travel Guide to Tanzania.